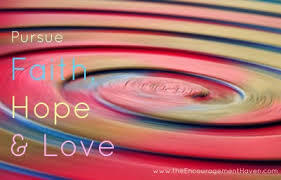 What part of the Bible comes to mind when you think of Faith, Hope and Love? Many people think of 1Corinthians 13, the so called love chapter. I was surprised to learn the other day that this trio of virtues also occurs in nine other places in the New Testament. What other three aspects of the Christian life are grouped together so often in the New Testament? None that I can think of. They must be important to God and for us that they are found so frequently. Each one is incredibly important alone, but together they speak volumes to the life of Jesus followers. I think of the word “synergy”. A concept that tells us that the whole is more than the sum of the parts. 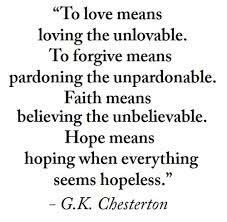 I believe that this is true with Faith, Hope and Love. Considering this “whole” of faith, hope and love, I have some thoughts. I think God loves us and wants us to be happy. Because of this he has opened the eyes of our hearts (Ephesians one) and this causes us to begin to understand the depths of his love (Ephesians four) and Faith comes alive in our being (Ephesians two – no, this is not a study of Ephesians). With this Faith we begin to love God and our fellow man. This love idea is basically a new concept for us that comes from the Greek word agape, which means to give of ourselves to those in need, without merit; those who have done nothing to deserve our love, and whom we don’t expect to pay us back. This is the kind of love God shows humanity a million times a day, and is especially apparent in the sacrifice of Christ on the cross. Because of the Faith that this love fosters within us, we begin to demonstrate this kind of love toward others. Experiencing this love causes us realize that God is not only good and generous to us in this life, but that there is an afterlife which will make us far happier than we can imagine trodding this earthly soil. That is our hope. 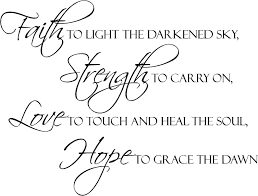 My purpose in this post is not to give a theology of faith, hope and love, but to give you the scriptures that mention faith, hope and love, allowing you to ponder the significance of these virtues as a whole, and let God grow the truth of these attributes in your hearts and minds. 1Th 1:2,3 We thank God for you and always mention you in our prayers. Each time we pray, we tell God our Father about your faith and loving work and about your firm hope in our Lord Jesus Christ. 1Th 5:8 But we belong to the day. So we must stay sober and let our faith and love be like a suit of armor. Our firm hope that we will be saved is our helmet. Rom 5:2-5 Christ has also introduced us to God’s undeserved kindness on which we place our faith. So we are happy, as we look forward to sharing in the glory of God. But that’s not all! We gladly suffer, because we know that suffering helps us to endure. And endurance builds character, which gives us a hope that will never disappoint us. All of this happens because God has given us the Holy Spirit, who fills our hearts with his love. 1Co 13:13 For now there are faith, hope, and love. 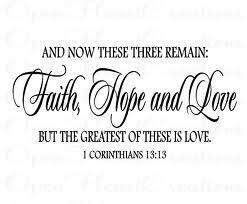 But of these three, the greatest is love. Gal 5:5,6 But the Spirit gives us hope that God will accept us because of our faith in Christ. If you are a follower of Christ Jesus, it makes no difference whether you are circumcised or not. All that matters is your faith that makes you love others. Col 1:4,5 We have heard of your faith in Christ and of your love for all of God’s people, because what you hope for is kept safe for you in heaven. You first heard about this hope when you believed the true message, which is the good news. Heb 6:10-12 God is always fair. He will remember how you helped his people in the past and how you are still helping them. You belong to God, and he won’t forget the love you have shown his people. We wish that each of you would always be eager to show how strong and lasting your hope really is. Then you would never be lazy. You would be following the example of those who had faith and were patient until God kept his promise to them. Heb 10:22-24 So let’s come near God with pure hearts and a confidence that comes from having faith. Let’s keep our hearts pure, our consciences free from evil, and our bodies washed with clean water. We must hold tightly to the hope that we say is ours. After all, we can trust the one who made the agreement with us. We should keep on encouraging each other to love and to do helpful things. 1Pe 1:21,22 And when he did come, it was to lead you to have faith in God, who raised him from death and honored him in a glorious way. That’s why you have put your faith and hope in God. You obeyed the truth, and your souls were made pure. Now you sincerely love each other. But you must keep on loving with all your heart.